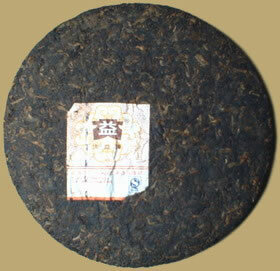 7262 ripe Pu-erh cake is a middle grade standard product of Menghai Tea Factory, consists of larger fat mature leaves and cover the cake surface with tip leaves, moderately fermented for a strong flavor and pure aroma. As a excellent Pu-erh, Dayi 7262 won silver award in the 6th International Famous Tea Competition held in Hong Kong. This 2007 vintage ripe Pu-erh gives a deep red infusion and release a mellow flavor, although ready to drink now, but with time, the tea will turn into something exceptional.